I am fast coming round to Ed Balls, now Labour’s shadow chancellor of the exchequer, finally pitted in one-to-one combat against the mad axeman and economic illiterate, George Osborne. The Tories and their little echo LibDems, loyally reflected back by the media, are accurately reciting Balls’s assets, but mostly shaky about his supposed defects. The plus side is self-evident: Balls the political heavy hitter, variously described as the bruiser, the attack dog and the rottweiler; the highly qualified economist with a quarter-century of experience at the national economic coal-face; the ferocious self-confidence that probably comes from his brave personal triumph over a wretched childhood challenged by cruel mockery of his surname and stammer; and not least the husband of an equally literate, equally intelligent and equally politically savvy (not to mention more attractive) wife. The Tories and much of the obedient media have rushed to crow over Balls’s alleged vulnerabilities, especially his close identification as Gordon Brown’s right-hand man with the record of Labour’s 13 years of “economic mismanagement” leading to the “mess we have inherited”. This, though, may come back to haunt the Tories and prove to be a source of considerable strength for Balls. Labour is currently badly wounded by the Tory and LibDem lie, constantly repeated to the point where it’s in danger of becoming part of the received wisdom, according to which the financial and economic crisis beginning in 2008 was caused by reckless over-spending by the Labour government under Blair and, especially, Brown, requiring borrowing on an unprecedented scale and a monumental deficit; and thereupon aggravated by the failure of Brown and Balls to admit that the deficit represents the nation’s overwhelming and most urgent problem, whose solution justifies heroic pain and sacrifice on the part of the entire citizenry (especially, as we’re now finding, the poorest and most vulnerable). Additional counts in the Tory-LibDem indictment are Labour’s failure to regulate the banks more rigorously — Balls is vilified as prime architect of Labour’s inadequate regulatory system — and the refusal, first by Brown and now by the Eds Miliband and Balls, to spell out what would be Labour’s alternative plan for cutting the deficit: Labour, it’s said, condemns the coalition’s cuts but won’t say what cuts a Labour government would make. The Tory-LibDem accusation is, further, that Balls and Miliband are at odds over economic policy, Balls having earlier condemned as unachievable Alistair Darling’s project, endorsed post-election by Miliband and Alan Johnson, for halving the deficit in four years. And, finally, the coalition partners point to Balls’s elevation to the shadow chancellor job as posing a mortal threat to Miliband’s leadership, given Balls’s remorseless and allegedly unscrupulous ambition. the measures initiated in their final weeks in office by Brown and Balls to stimulate demand, minimise the rise in unemployment, and head for renewed growth as an essential element in the eventual reduction of the deficit. It ignores the human reality that unemployment and prolongation of recession are a greater threat to the nation’s well-being than the deficit, and that reducing, not increasing, unemployment and stimulating, not dampening, demand in the economy are indeed essential tools for repairing the deficit, minimising (but not entirely escaping) the need for damaging and premature cuts in government expenditure and equally deflationary increases in those taxes which most affect the level of demand in the economy, such as VAT. Then, finally, the Tory-LibDem case against Labour in general and Ed Balls in particular has the bare-faced effrontery to suggest that on all these counts Labour in office was at fault while the Conservative and Liberal democratic parties in opposition knew better all along. In fact, far from attacking the Labour government for reckless over-spending up to 2008, the Tories promised to maintain Labour’s expenditure levels; far from pointing to Labour’s regulatory system as insufficiently rigorous, the Tories echoed their banker friends’ and funders’ shrill demand for greater deregulation; far from supporting Labour’s successful initiatives, replicated around the world, to rescue the banking system and then to prevent recession degenerating into slump, the Tories denounced them as spendthrift, without ever suggesting what they would have done instead; and far from endorsing Labour’s prompt measures to restore growth by minimising unemployment and stimulating demand, measures which were already beginning to bear fruit in the first months after the coalition took office, the Tories and their obedient LibDem partners have enthusiastically reversed every one of them, imposing cuts that can only aggravate already high unemployment and tax increases that can only tend to suppress demand, thus putting at serious risk the nascent but still weak signs of gradual recovery. The first lie – now being energetically promoted by David Cameron and his ministers – is that the whole fiasco was the fault of Labour politicians, and of failed government regulation. There is, of course, a grain of truth in this; the banks, for the last two decades, have not been properly regulated at all. To suggest that this is exclusively the fault of politicians, though, is to go into a weird kind of denial about the extent to which all politicians, and their cash-hungry political parties, are now subject to the colossal power and influence of the new plutocracy, and dependent on their approval. If the banks had wanted better regulation at any time during Tony Blair’s premiership, they could have had it on request. But they wanted ever more deregulation, as did their supporters in the Conservative Party, and that is what they got; nor would they have hesitated to make mincemeat, using every means at their disposal, of any politician or party who failed, at the time, to go along with their wishes. It’s hard to think of any front-rank politician better qualified by forensic skills, economic expertise, and practical experience at the centre of power, to expose these monumental Tory-LibDem lies than Ed Balls. The lies must be comprehensively exposed and the fundamental dishonesty, the breath-taking opportunism, of the liars brought home to the electorate, if Labour is ever to regain the respect for economic competence that it had earned and deserved during more than a decade in office and which is a necessary (but not sufficient) condition for winning any future election. A remorseless counter-attack is long overdue, and Ed Balls is self-evidently the man to lead it. We have all had our reservations (or worse) about the uglier aspects of the behaviour in both No. 11 and No. 10 Downing Street of Gordon Brown and his team, of which Ed Balls was the most prominent leader and Ed Miliband a junior member. The downside of Balls’s energy, confidence and aggressiveness is that they can quickly lapse into bullying. Ambition, while a natural attribute of a hugely talented politician, can be grossly destructive when it degenerates into obsession and bitter resentment, as we saw throughout Gordon Brown’s long years as chancellor. If Ed Miliband is ever to become prime minister, faced with the need to choose his chancellor of the exchequer, he will need to think hard and long before risking the appointment to the next most powerful position of a possible rival and potentially an apparently congenital control freak. But a shadow chancellor, in opposition to a reactionary and mendacious government, is a different matter. Ed Balls is formidably well equipped for this role. Welcome aboard, Ed jnr: go for it! Wasn’t Mr Johnson’s main qualification that he wasn’t Mr Balls? All been changed so soon? Brian writes: Thanks, John. 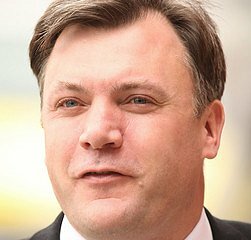 I suppose it was one thing to pass Ed Balls over once, when his claim to the job was so obvious and strong; to have done it a second time when the post became unexpectedly available again so soon (and after Alan Johnson had manifestly not been up to it) would have risked making Balls a serious and implacable enemy. Only two other candidates could have been considered serious contenders: and of these, David Miliband is still evidently unwilling to serve under his kid brother, and to have appointed Mrs Ed Balls, aka Yvette Cooper, in preference to her husband would have seemed a double slap in the face. IOW, there wasn’t a serious alternative. The downside, as I see it, is that having already been forced to specify which Miliband we’re talking about when we mention that surname, we now have to specify which Ed we mean as well.